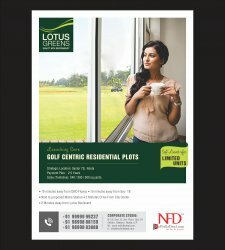 Keeping in mind the requirement of different buyers, City Plots by Lotus Greens Plots comes with wide option of 200, 300 and 500 sq. yd. Your limit of happiness never ends as the residences throw a picturesque view of plush green landscape. Located in the most desired location of Sector 79, Noida, it makes one of the best options for purchasing plot. Sizes200, 300 & 500 Sq.yards. For more info visit our website: httpwww.lotusgreensplots.org.in/ or contact us @ 99999 99237. No Frills Deal Realty Services Pvt. Ltd.